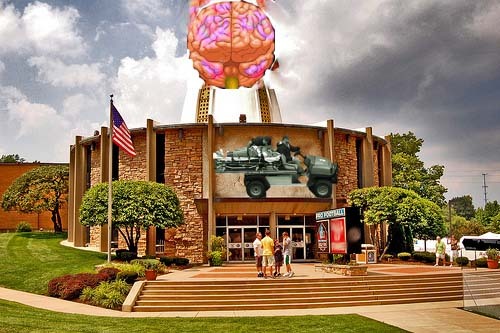 Newly remodeled Football Hall of Remembrance opens to celebrate Traumatic Brain Injury. Taking a page from big tobacco’s playbook, the industry insisted for years that football was not dangerous; eventually there were too many injuries at the high school, university, and professional levels to ignore. Professional teams found that medical insurance costs exceeded revenues—even if the revenue from sale of team products like hats and jerseys are included. With the profits gone, most owners took their investments elsewhere. Unfortunately, this left many cities with substantial debt for stadiums they built. Many are crumbling and have been condemned because of the degree of deterioration; there’s reason to repair them and no money to tear them down. Universities initially expected a huge financial crisis, but found that the sport had actually not been a money maker, in terms of real cash, but a huge annual loss. Without football many universities were able to improve facilities and pay teachers better. Football, is gone, but not forgotten—except by those who played the game and had their bells rung too many times. This entry was posted in Business, Celebrity, Communications, Culture, Healthcare, History, Humor, People, Philosophy, Science, Sports. Bookmark the permalink.